House Stuff Works: Recycle! Reuse! Reduce! New love: recycled glass anything. It's not so new, but still a great idea! Number one, Btown's all about recycling. Number two, it looks gorgeous. It all started with the tall floor vase for the front room, and then I bought another piece for a Christmas decoration project. Anthropologie fun. Assymetry = awesome. West Elm has these Spanish glass vases (literally from Spain) in beautiful colors that aren't your typical green and brown. Pier 1 - on sale! 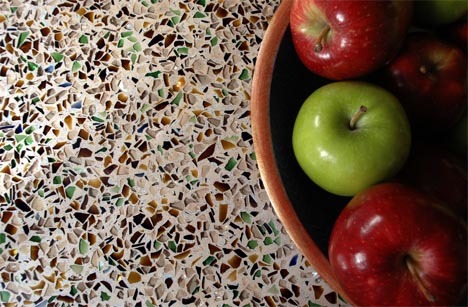 How about this: Recycled glass countertops, a great way to add color a boring kitchen. With recycled glass tiles, you have an infinite number of colors to choose from. and placed just right to avoid tacky. Picture from potterybarn.com. So with this inspiration, someday I'm going to figure out how to use those cases of wine bottles from the training group party. Here's one creative - and classy - idea from a fellow blogger: wine bottle candlesticks! She even includes detailed instructions on how to make them, with a few other good ideas for using empty bottles. I'll add this one to my to-do list. 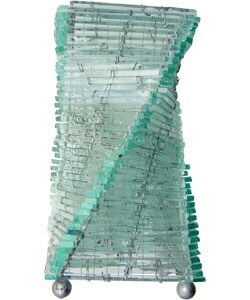 And since nearly everyone's thought it but never actually mustered up the motivation to do it, the wine bottle lamp. See Remodelista's blog for completely 100% detailed instructions - finally! I'm glad someone finally wrote this down!